Battleship ‘Queen Elizabeth’ bombarded Turkish forts of the Dardanelles. 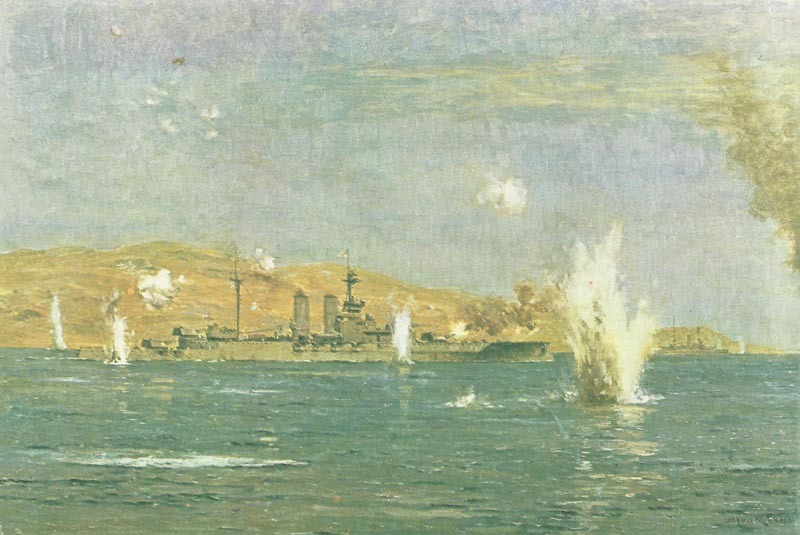 Dardanelles: Battleship Queen Elizabeth fires 21,000 yards over Gallipoli Peninsula at Narrows’ forts until next day. Aegean: ­2 Royal Navy battleships and cruiser Euryalus shell Smyrna (and on March 7 and 28). Turks sink 5 blockships making Smyrna Port unusable to U-boats (Allied fear). Argonne: Three unsuccessful German counter-attacks at Hill 263. Flanders: In private letter Sir J French laments ‘Silent Army’ of dead. Poland: Germans mass between Thorn and Mlava in North. Carpathians: Russians cross river Bistritza in east and threaten Austrian flank. Austrian Second Army vainly attacks until March 10. Anglo-Portuguese protocol defines Angola-Rhodesia border. Southwest Africa: 43,000 South African soldiers massed in 4 forces against 9,000 Germans. Western Front: German Army airship L233 shot down by anti-aircraft fire; crashes near Ostend. Germany: Government replies to US protest on war zone.